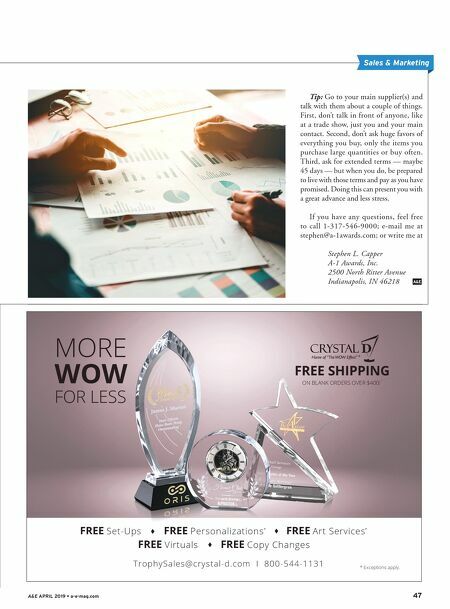 46 a-e-mag.com • A&E APRIL 2019 think about your inventory. And there are several issues. First, you need the facility to house your inventory. Then you need to stock your selected inventory. It will need to be parts or products that clients and prospects hope- fully buy time and time again. Repeat busi- ness drives the true success of your business. Tip: Remember you can make a good buy of something offered at a bargain price, but if you don't sell it then it is a drain on your business. Making good decisions takes effort and experience — sometimes you are forced to make an immediate decision and often you would be better off passing on the buy and waiting until something comes along that you know you can move quickly. 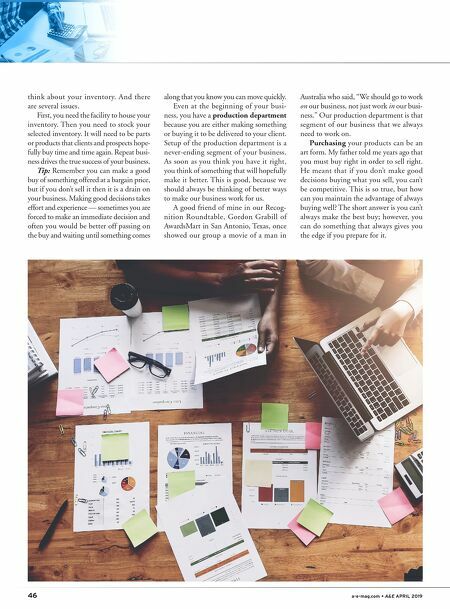 Even at the beginning of your busi- ness, you have a production department because you are either making something or buying it to be delivered to your client. Setup of the production department is a never-ending segment of your business. As soon as you think you have it right, you think of something that will hopefully make it better. This is good, because we should always be thinking of better ways to make our business work for us. A good friend of mine in our Recog- nition Roundtable, Gordon Grabill of AwardsMart in San Antonio, Texas, once showed our group a movie of a man in Australia who said, "We should go to work on our business, not just work in our busi- ness." Our production department is that segment of our business that we always need to work on. Purchasing your products can be an art form. My father told me years ago that you must buy right in order to sell right. He meant that if you don't make good decisions buying what you sell, you can't be competitive. This is so true, but how can you maintain the advantage of always buying well? The short answer is you can't always make the best buy; however, you can do something that always gives you the edge if you prepare for it.